The OmniTrax Interchangeable Sole System is a revolutionary new concept changing the way people think about footwear. The soles of Korkers shoes and wading boots can be easily changed and customized for a variety of different activities. This innovative Korkers OmniTrax Sole technology was created with 3 simple design criteria in mind: ease of use, reliability, and durability. Hundreds of hours of field testing have resulted in a design that is absolutely reliable. All Korkers OmniTrax Soles for Korkers Wading Boots are constructed of the highest quality materials, and are fully covered by our warranty. As the only wading boot manufacturer to offer interchangeable soles, Korkers provides an exclusive solution to help protect waters from the spread of invasive species while enhancing angler safety and performance. Through its unique OmniTrax Interchangeable Sole System, Korkers empowers anglers to fish responsibly with a range of specific outsoles - from traditional felt to sticky rubber - that meets the demands of the environment. OMNITRAX INTERCHANGEABLE SOLE SYSTEM OPTIONS Studded Kling-On Sole: High-friction tri-zonal sticky rubber excels in and out of water and reduces water absorption keeping them lightweight and reducing the spread of invasive species. 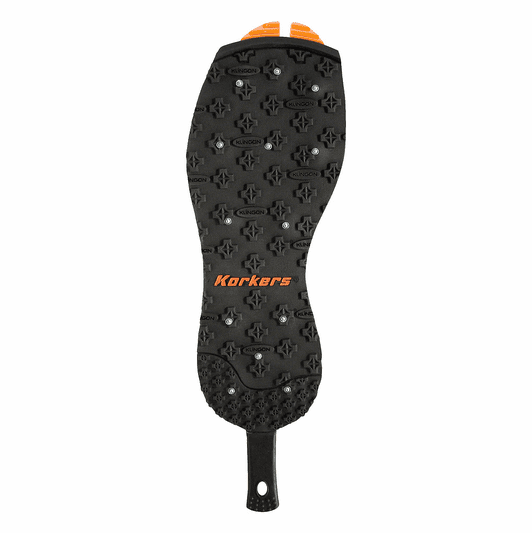 Korkers OmniTrax Sole: --- Studded Rubber Sole: A durable rubber sole with protruding carbide cleats. Excels in the most demanding conditions such as sharp, jagged or mossy rocks, submerged wood, or jetties. Korkers OmniTrax Sole: --- Studded Felt Sole: Compressed felt with embedded carbide spikes for use in extremely slippery conditions: wet rocks, moss, shale, wood or slab granite. Korkers OmniTrax Sole: -- Plain Felt Sole: Compressed felt for traction performance under water, on slimy rocks, wet wood, etc.